After giving my presentation in HITB I was fortunate to talk to some of the people that attended it and also some that contacted me via email afterwards. One of the most frequent questions I got was "how practical is it to implement a fuzzing acceleration framework?". Following up on that I decided to write a short post on the practical considerations of implementing an accelerated fuzzing framework by using DBI. Some of the material in this post is based on one such Q&A discussion that I had with Peter Van Eeckhoutte (@corelanc0d3r) and published with his gracious permission. This section is aiming to provide a quick introduction to the subject. If you're familiar you can jump to the next section - practical implementation considerations. Following HITB I wanted to make sure all of you know where to get the materials if you need those. The presentation is here, the source code for the pintool examples can be found here. If you are looking for more explanations of each of the code samples see this post. Recently I've had a lot of discussions with people that attended the presentation in Amsterdam and with others regarding check-pointing techniques. 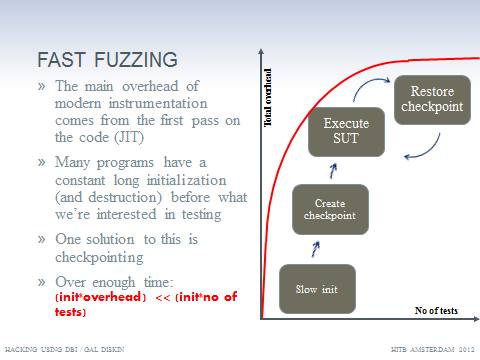 Mostly for the sake of using check-pointing to perform high speed fuzzing but for various other usages as well. Since this seems like a topic that interests many people I've decided to write a blog post to detail some of the practical considerations implementing such systems. Look forward to this post soon.